Things aren't different. Things are things. Important Note: This weeks competition is over and no further scores will be accepted. Better keep an eye out! Those meany Beanies are buzzing the city again. 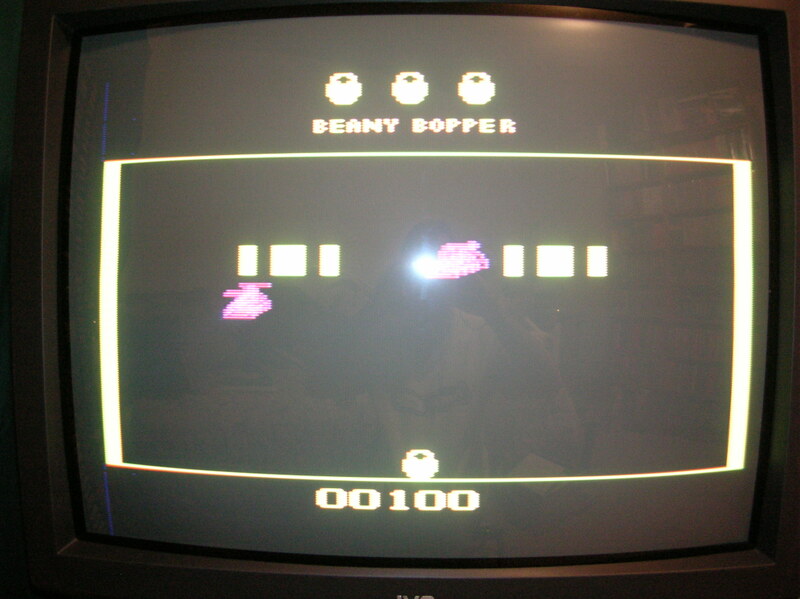 There's just one way to stop them - bring out the amazing one-eyed Beany Bopper! 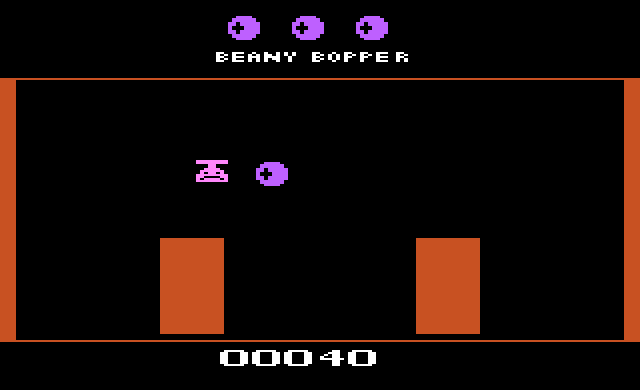 Go ahead, take control of the Beany Bopper's rapid-fire stun gun and bop those Beanies before the put your eye out. Be ready for plenty of action! 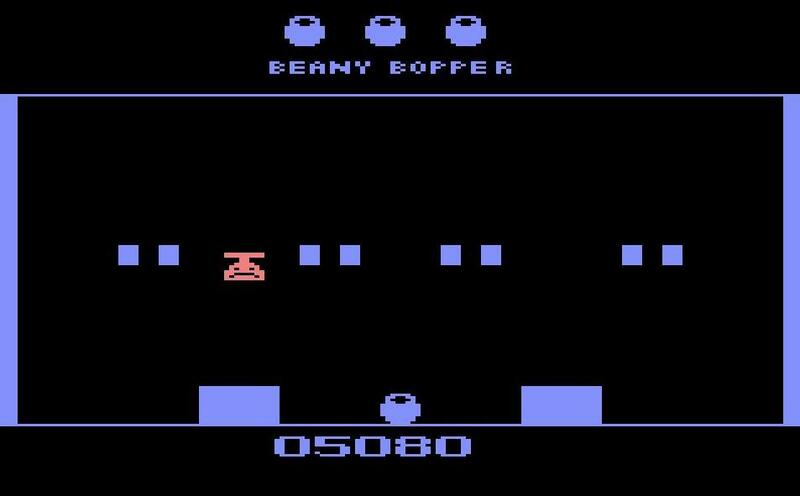 Beany Boppin' will keep you hoppin! Capture a Bouncing Orange Eye - Twice the Value of an Object at that Level. You can shoot a longer distance if you don't hold the joystick button down. 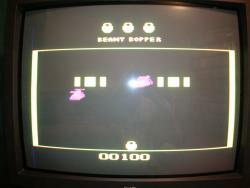 Keep an eye on your reserve boppers and don't be too greedy with points. 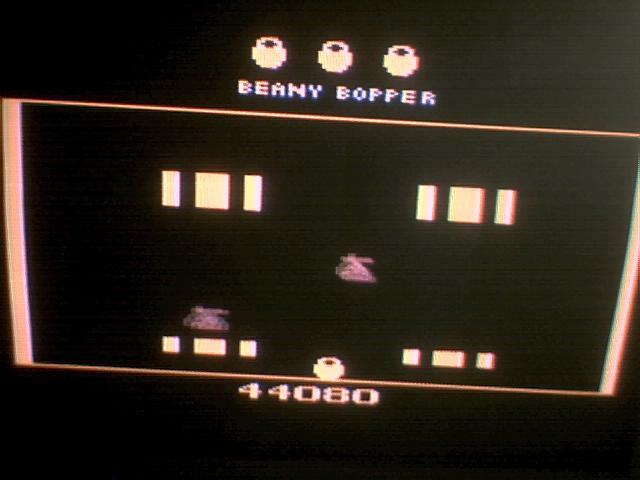 You may have to let some objects fall off the screen in order to have the opportunity to sack four more Beanies and earn a bonus Bopper! When the beanys are going obnoxiously fast, stay in one spot. Not only is it easy to defend yourself, there is a much higher chance of getting hit if you are moving. It will be your first instinct to run away from a fast beany. DONT. Move away from it at a right angle. You can easily outmaneuver them. Try mashing the fire button all of the time. Your thumb my get sore, but it will be helpful later on. This game has really bad hit detection, keep that in mind when evading beanys. Milk the eyes for points early on. You'll get a large amount of points pretty quick compared to grabbing the missiles. Try to keep 3 lives at a time. Prioritize getting lives when you have 2 of them. Try using different controllers, find one that works the best. I personally use the original Sega 6-button controller instead of a CX-40. A few VITAL tips in case you want to try to roll your score before the game week ends. 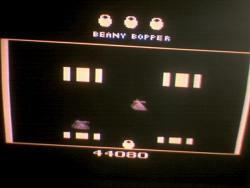 - After you destroy 4 beanies you get a free bopper life, and this enables the oranges to fly down. - So by "holding down" the fire button this will give you aufo-fire. (short range auto-fire) Try shooting upwards at those oranges and that will keep bopping up your score. The key to a best score is to keep rolling over those oranges at a fast pace, run after them if you have to, don't worry about much just run into them, as they won't hurt you as "oranges". - With this technique, by the time you get 60,000... 100,000 is not far off! Just keep at this plan, and keep destroying 4 beanies to get ur extra life or more important them oranges! -After 100,000 well you're on your own, lol. LET'S FOLLOW TWIN GALAXIES SPECIAL RULES FOR THIS GAME: "Pressing SELECT GAME switch at any given time (Beanies pass through any obstacles) is NOT ALLOWED." 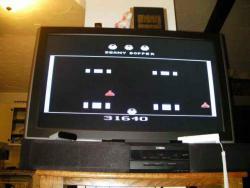 So, DON'T press SELECT during gameplay after opening this game (VCS or emulator). Edited by oyamafamily, Wed Jan 6, 2010 11:23 AM. Edited by Zoyx, Wed Jan 6, 2010 7:05 PM. Which way would you like the game rolled? Front to back or side to side? 101,130. The screen doesn't show much other than the numbers 01130. Score rolls at 100,000 ? That has to be one of the quickest to roll of any 2600 game. How long did it take... 20 minutes? I'd say it took me less than 10 minutes. I dont know if that counts, though. Edited by brandondwright, Wed Jan 6, 2010 11:09 PM. I will fire this one up just to roll it. It's one of the few I can roll, even in my old age. That is cool. Can't use old scores for HSC submittals, but you should be able to duplicate it (roll it) in just a few minutes and have it count for the week. It's like Chopper Command ... pretty much "roll on demand" except instead of a couple hours it takes a couple minutes. Wow, you think its that easy? It took me a whole crap ton of trys to be able to get a score beyone 101,000. I tried it again, while it is not as high, I got a solid 102,540. Edited by brandondwright, Thu Jan 7, 2010 8:59 PM. I think it is really too bad that it rolls at 100k. That is when the difficulty finally ramps up, although it ramps up quite a bit IMO. Things move faster and the obsticles go invisible. It is just getting interesting and then it rolls. I can't get past the ramp up at 30k. Any hints? I've played it a little more for fun and have to take back what I said earlier. It gets EXTREMELY hard above 100k. 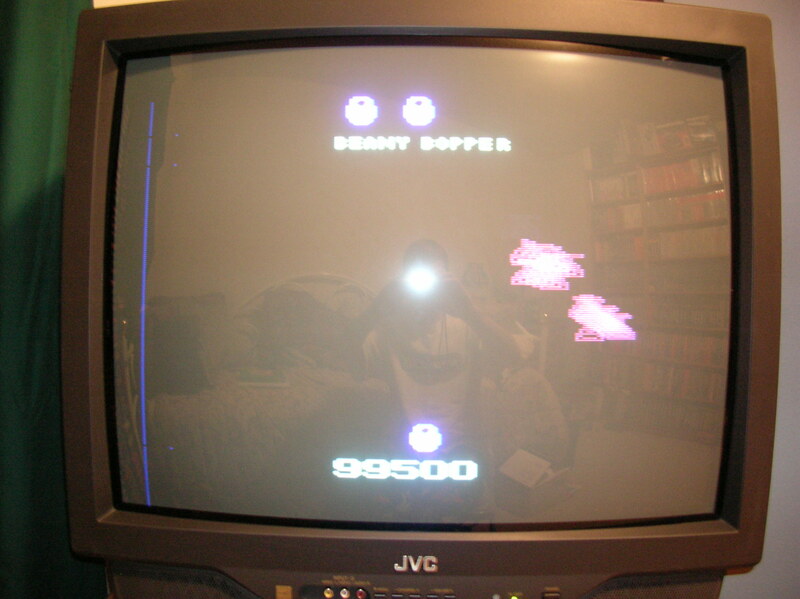 I FOLLOWED Twin Galaxies Official Rules for this game. Edited by JacobZu7zu7, Sun Jan 10, 2010 12:05 PM. I beat my twin galaxy score. I plan on submitting one today. 3rd place, here I come! @ JacobZu7zu7 - Doesn't work that way in a roll situation. Once you roll it, you are automatically tied for first. Zoyx is right, but the official rules state that we are free to outdo each other after the roll. I'm not in it for bragging rights, I'm in it to have fun. It is always fun to WIN!